Ahad Ali alia494@newschool.edu PhD Sociology of Knowledge, Science and Technology Studies, Public Sphere, Media Studies, Data Mapping, Digital Cultures, Research Methods. Douglas De Toledo Piza pizad016@newschool.edu PhD My investigation focuses on how globalization shapes spaces. I analyze the international commerce de-regulation in a special economic zone, and the immigration law reforms in the Paraguay-Argentina-Brazil tri-border area. Subfields: Global and Transnational Sociology, Development Sociology, Economic Sociology, Anthropology of the State, and Migration and Mobility Studies. Topics: informal economy, markets, special economic zones, borderlands, and migration. Amanda Delong deloa325@newschool.edu PhD Sociology of health and illlness, cultures of medicine, reproductive technologies, genetic selves, kinship studies, mental health, biopolitics and medical anthropology. I'm also interested in contagion, networks and epidemics. Kumiko Endo endok750@newschool.edu PhD Cultural sociology and economic sociology with an emphasis on intimate/family life. Area of expertise: Japan, East Asia. Other research interests: globalization; religion; second modernity. Emmanuel Guerisoli guere469@newschool.edu PhD PhD Candidate, Proposed dissertation title: "Dual State and Multiple-Class Citizens: Extra-legal Institution Building and The Stratification of American Citizenship in the War on Terror"; Committee Members: Andrew Arato (Chair), Carlos Forment, Miriam Ticktin, and Andreas Kalyvas. Classical and Contemporary Sociological Theory, Political Sociology, Historical Sociology, Sociology of Violence, Crime and Deviance, State Formation, Sociology of the Rule of Law and the Exception, Citizenship, Law and Society, Revolutions and Political Violence, Democratic Theory, Dictatorships and Authoritarian Regimes, Constitution Making, Sovereignty and Constituent Power, Humanitarianism and Anthropology of Human Rights, Neoliberalism and Sociology of Capitalism, World System Analysis. 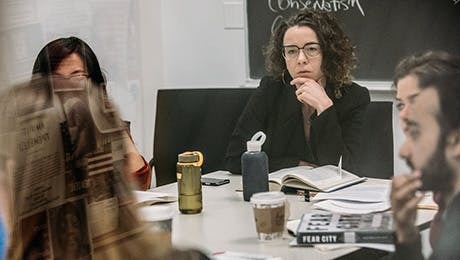 Mario Hernandez hernm680@newschool.edu PhD Research focuses on themes in urban sociology- The revitalization of cities, gentrification, urban design, race and ethnicity. Subject areas include the use of media such as data, mapping and visualization and the sociology of culture with regard to artists shaping the urban landscape in Bushwick, Brooklyn. Zachary Metz metzz793@newschool.edu PhD My research focuses on the sociological dynamics of intractable, long-term and violent conflict. I am interested in the drivers of intractability, what distinguishes intractable conflict from other types of social stratification, and also the "seams" at which intractability is challenged by people in small, powerful ways reaching across lines of conflict. Jussara Raxlen raxlj632@newschool.edu PhD My dissertation examines how the concept of “care” travels within and across several sites and institutions involved in the provision of paid home care for the “young, infirm, disabled and frail.” Drawing a map of the meanings, practices and classificatory struggles that constitute the field of home care in New York City, the aim is to understand the challenges and possibilities that constrain and enable the city’s care regimes. Areas of study: sociology of culture, sociology of knowledge, classification systems and the politics of knowing; domestic and care work; theories of subjectivity and embodiment; governmentality; and boundary work. Tim Rosenkranz roset997@newschool.edu PhD My dissertation analyzes processes of national tourism marketing as case of the organizational transformation of the nation-state in global markets. Area of Study: Globalization, Economic Sociology, Organizations, Sociology of Culture. Elizabeth Ziff ziffe406@newschool.edu PhD My dissertation focuses on military spouses who have been surrogates for other couples or individuals. My areas of interest are: Reproductive Sociolgy, Sociology of the Family, Intersections of Race, Class and Gender and Quantitative and Qualitative Methods.